When’s the last time you were inspired by a great talk by an influential leader? In my spare time, I find myself on the hunt for inspirational gems. Talks, presentations or speeches that I can use to inspire my team, my clients and our partners. I can’t say enough about the feeling I get when I watch or listen to a great talk. The kind of talk that will make you drop everything that you are working on and re-consider the current state of your organization, and your company core values. I just watched a Simon Sinek TED Talk from 2009 – Start with Why. An oldie but a goodie. I haven’t watched this in years, but like all memorable speeches, I like to re-visit it from time to time. I feel that I will interpret something completely different, depending on my circumstances at that point in time. When I first saw the video, it didn’t have the same impact that it has on me when I watch it now. Things have changed significantly in my life since 2009. Back in 2009, I was a Senior Product Manager of a software company, and as much as I found this topic interesting, it didn’t make me drop everything and rethink what I was doing. Fast forward to 2015, and things are completely different. Now, as Principal of TPM, Start with Why made me drop everything and rethink how I, and my clients, operate. If you haven’t had the opportunity to watch Simon Sinek’s 2009 TED Talk video, Start with Why, I suggest that you carve out eighteen minutes of your time to watch it. In the video, Simon discusses why some people and/or companies are able to achieve great success, while others aren’t as lucky. Both parties may have access to the same money and resources, as well as exist in the same market conditions, but something else determines those who achieve great success from those who do not. Simon uses Apple as his example of a wildly successful company. Apple has access to the same talent, the same agencies and the same funds as other companies, but they have been able to revolutionize the market, where others have failed. Why do some succeed where others fail? Simon compares Apple with that of Dell. Both are computer companies, and as mentioned, both have the same access to talent, money and resources. But would you purchase an MP3 player from Dell? (After hearing this analogy, I actually had to “Google” Dell to see if they do in fact carry MP3 players… and they do!) He states how strange it may feel to purchase an MP3 player from a computer company, right? Hello, Apple iPod – millions of people do buy MP3 players from a computer company! So how does one company have a greater impact on customers than the other? How is Apple so successful? Is it the fancy marketing, nicely branded box or lanyard-wearing customer service reps? No. It’s the way that they communicate–a way that is the opposite of how everyone else communicates. 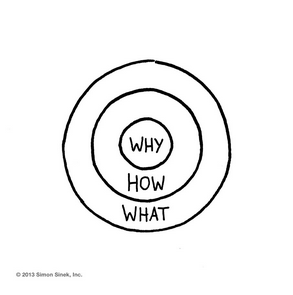 I grabbed some information on the Golden Circle from Sinek’s website: www.startwithwhy.com. This website is a great place for resources on this subject. Simon offers an array of downloadable materials that you can use to spread the “Why” message. In Start with Why, Simon uses the Golden Circle to explain how companies communicate. I love this analogy, as it makes perfect sense, so I want to share it with you. Most companies communicate what they do. They tell us what products they sell and what services they offer. Some organizations go a step further and communicate how they do it. The how is usually what differentiates them from the competition. The center of the Golden Circle is the why. Unfortunately, few companies communicate why they do what they do. The why is the company’s purpose, belief or cause; the company’s core values. It’s the very reason the organization exists. Each component of the Golden Circle correlates with the human brain. What represents the neo-cortex and is responsible for rational and analytical thought and language. How and why represent the limbic system, responsible for all decision-making. Many companies communicate from the outside of the Golden Circle towards the inside, meaning they start with the what and move inward. The majority of companies stop at the what, but some continue and stop at the how. In doing so, consumers will understand the features and benefits, but we aren’t necessarily driven to buy. Most companies will communicate starting with the clearest point and then move to the fuzziest. They will tell us what they do and how they do it and expect a behavior from us, but this doesn’t work. By telling us why they do what they do, it creates a personal connection to the company. As a consumer you understand what the company believes in, the company core values, and will most likely be more inclined to purchase from them. What about the cloud and hosting industry? We deliver secure, reliable, cost effective custom solutions. Choose our secure, scalable and easy to use platforms. We are a leading North America hosting provider. We provide best in breed hosting services that our customers love. Cloud hosting, proven reliability with enterprise infrastructure enhanced security and massive scalability guaranteed best performance. Do any of the above statements make you want to run out and hire the particular company? Imagine the impact a hosting company could have if they started with the why? By making this change, do you think one company could revolutionize the cloud and hosting industry? There is a huge opportunity for this to happen and frankly I’d love to see it happen. The Why: Why the company does what they do? Doesn’t that make you feel warm and fuzzy? This is a good example of how including the why can make all the difference in how you communicate. A why statement can mean different things to different organizations and it really comes down to the company core values and beliefs. 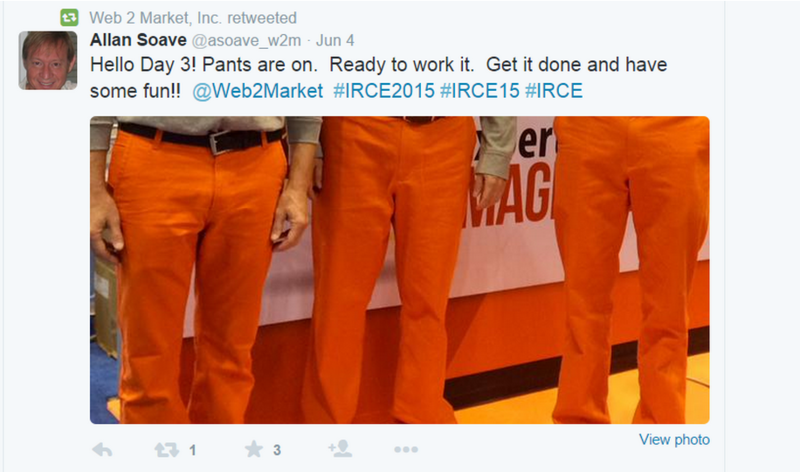 Who wouldn’t want to work with these guys? As a result of the “We’re Crazy about Magento” why statement, tweet and retweet, the company is getting a ton of traffic to their website. Successful companies communicate in reverse: They start with the why, and then move to the how and the what. The why should tell the public what the organization is all about, inspiring and driving behavior. Web2Market stand behinds their why and it is very apparent everywhere you look that they are “Crazy about Magento.” Whether you visit their Facebook page, Twitter feed, website, or see them at a trade shows, you know what they are about. 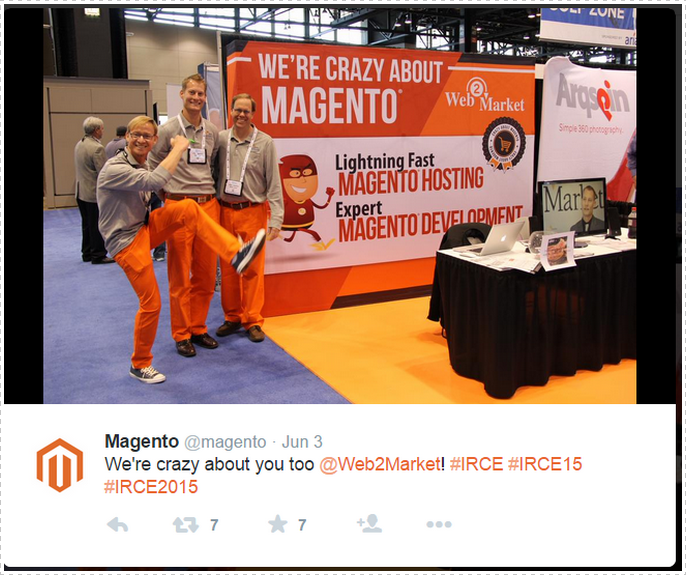 Now if you are looking for a company to code, host and offer you support for your Magento site, where would you turn? To the company that “Delivers secure, reliable, cost effective custom solutions,” or to the orange-pant-wearing folks who absolutely love everything about Magento? What you believe in means everything to your customers. If your organization has a purpose and you can effectively communicate it to the masses, this sort of thing has legs of its own and there is no controlling how successful your company will be. If you communicate why you do what you do, people will believe you. If you would like to learn more about how Total Product Marketing can help you define your why, contact us today.